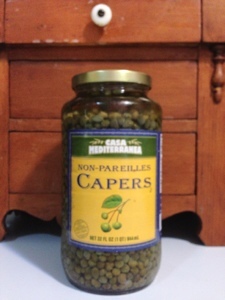 I don't use capers fast and end up throwing away the dregs of the Costco-sized jar. But it's still more economical for me to buy the large jar. I love the sour and salt flavors, and, if I have a tiny jar, I skimp. It occurred to me to include my ratatouille recipe, but it's free form. I use what summer veggies I have, sauté them in lots of olive oil, and cook until tender. The capers get thrown in at the end. I serve ratatouille cold or hot, and I have good luck with freezing. Once frozen, it's best hot, but if never frozen, it's best cold.